To improve shape, performance and comfort, manufacturers claimed numerous inventions. 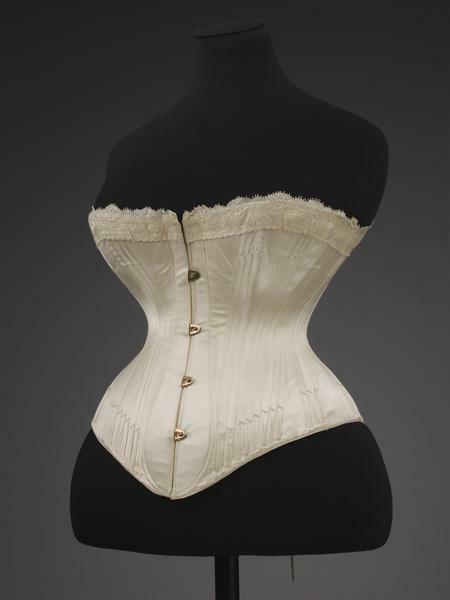 One of the most successful was the steam-moulding process developed by Edwin Izod in 1868, and still used in the 1880s to create elegant corsets such as this one. The procedure involved placing a corset, wet with starch, on a steam-heated copper torso form until it dried into shape. The result was a beautifully formed corset, whereby 'the fabric and bones are adapted with marvellous accuracy to every curve and undulation of the finest type of figure' (The Ladies' Gazette of Fashion advertisement, London July 1879). 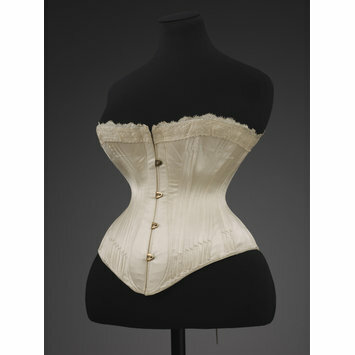 This corset was worn by the donor's mother at her wedding in 1887. 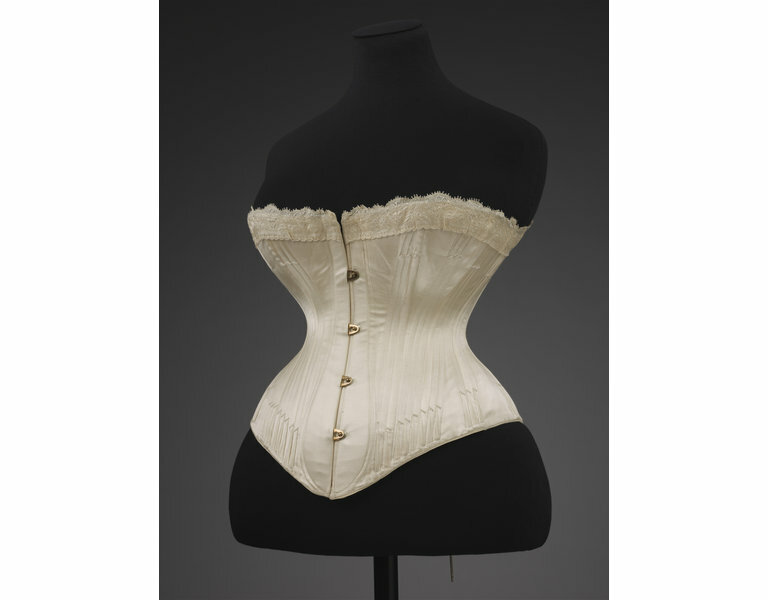 Corset made of white satin with metal slot-and-stud fastening. With hand silk flossing and a machine-woven silk braid trimming. Lined with coutil. Spoon busk and back facing. Edwin Izod was a British corset manufacturer whose factory was located in Hampshire in the late 19th century. According to the record of his baptism, Izod was born on 25th of December 1826 and baptised in the parish of St. Leonard's in Shoreditch in 1829. The 1881 Census recorded that Edwin Izod's business employed a workforce of 23 males and 337 females. According to the National Probate Calendar Izod died at Stanfield House, Southampton, in 1887. Brides-to-be were advised to buy at least one corset as part of their trousseau, the collection of clothes and linens they prepared for their marriage. This corset was manufactured by Edwin Izod, who used a steam-moulding technique to improve his corsets' shape, performance and comfort.